Back in March, I shared something we had recently discovered in the Special Collections vault: an 1835 edition of Cruikshank at Home, inscribed by noted authors Samuel Clemens (Mark Twain) and Eugene Field. 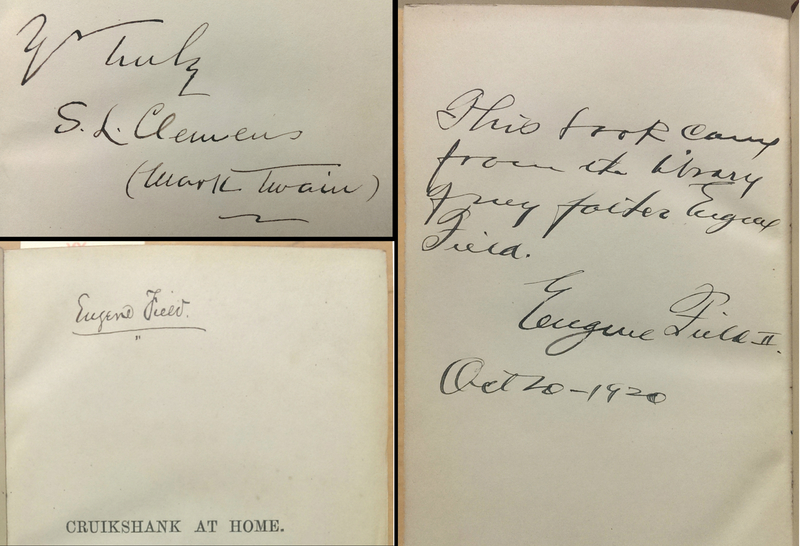 We were excited to find the autographs of these two 19th century literary giants, especially because no mention of the inscriptions was made in our library catalog. 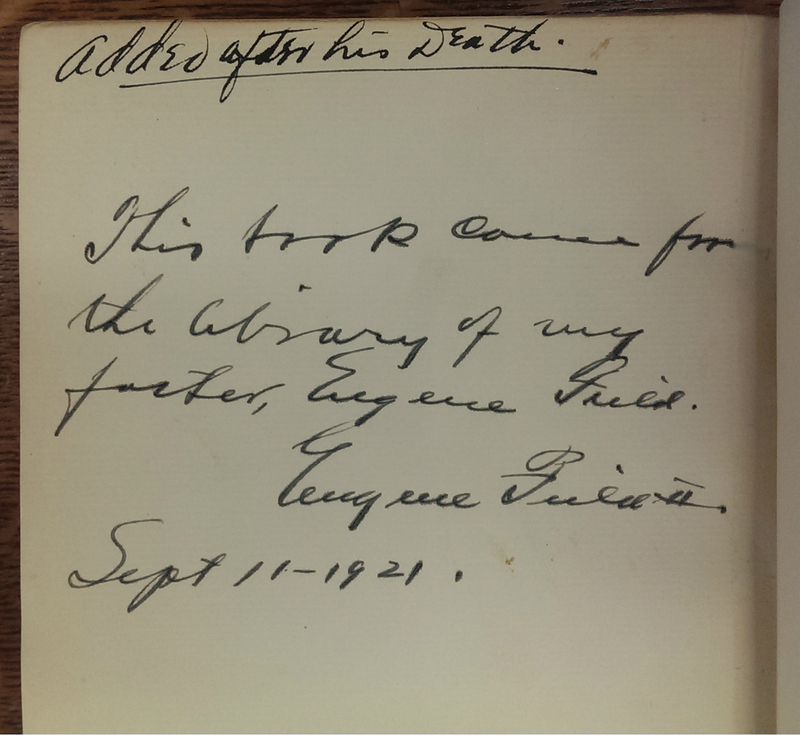 However, our excitement began to sour somewhat when we discovered an additional inscription in the back of the book: a note from Eugene Field II, son of the famous poet. At face value, the note seemed to corroborate the authenticity of the signatures, claiming that the volume had come from the library of Field Sr. — but a little research cast doubt on this assertion. It turns out that the younger Field was a notorious forger of literary autographs, including his father’s and Twain’s. Lacking the requisite expertise to tell a well-faked Twain signature from the real deal, we exhibited the book as a curiosity, but could say nothing more on the matter. While we are still unable to take a confident position on the authenticity of the signatures, just recently we’ve made some additional (re)discoveries that have thrust our questionable Cruikshank back into the limelight. On September 29th, 1952, Mr. Charles G. Munn of the Reynolds Spring Company of Jackson, Michigan, very kindly donated his private library of 700 volumes to Michigan State College. Mr. Munn’s books were officially appraised by the Manufacturers’ Appraisal Company at $4,000. Standard authors… were represented by exceptionally well bound sets, and among these were some first editions, some books with outstanding illustrations, and no less than ten autographed volumes and sets. Now, at least, we knew where we had acquired the volume. Interestingly, the Clemens and Field autographs were not only known, but were a highlight of the collection. It’s amazing what knowledge can be lost when you don’t keep meticulous historical records (this acquisition, remember, came a full decade before Special Collections existed as a separate library). As an institution, we had forgotten all about the inscriptions over the course of the last 60 years. Works… With His Letters and Journals, and His Life, by Thomas Moore, Esq. London, Murray, 1832. 14 vols. ; bound in green leather, gold tooled. Autograph of Eugene Field on title page. Appraisal $119. Letters to His Son… on the Fine Art of Becoming a Man of the World and a Gentleman… With Topical Headings and a Special Introduction by Oliver H. G. Leigh. New York, Dingwall-Rock, c 1901. 2 vols. ; bound in red leather, gold tooled. “Of the Beau Brummel Edition of the Earl of Chesterfield’s Letters to His Son, 1999 sets have been printed of which this is set No. 1111.” On back page: “Added after his Death. This book comes from the library of my father, Eugene Field. Eugene Field II. Sept. 11, 1921.” Appraised at $100. The Writings in Prose and Verse… N. Y., Scribners, 1896. 12 vols. ; bound in blue leather, gold tooled. Autographed on fore page of Vol. 1 by Julia S. Field (Mrs. Eugene Field). Appraised at $96. A History of the Life and Voyages of Christopher Columbus. London, Murray, 1828. 4 vols. Penciled notation “First Edition” on fore page. Eugene Field’s autograph on inside cover. Appraised at $100. The Plays and Poems… according to the Improved Text of Edmund Malone… ed. by A. J. Valpy. London, Bohn, 1853. 15 vols. ; illustrated with steel engravings. Vol. 1 contains autograph of Eugene Field at top of title page and autograph of S. L. Clemens (Mark Twain) on fore page. Appraised $225. Works. New York, Doubleday, 1922. 16 vols. Seawood Edition “…strictly limited to 1075 numbered and registered copies, each with a portrait signed by the author in volume one.” Mr. Munn’s set was No. 2. Vol. 1 is signed by “Doubleday Page and Co.” and undersigned by Booth Tarkington and each of the remaining volumes is autographed by Tarkington on the title page between title and publishers’ data. Vol. 1 also contains autograph of Julia S. Field (Mrs. Eugene Field) on a fore page. The set appraised at $128. We had struck a Eugene Field gold mine: three additional volumes supposedly bearing Field’s inscription, one of which also featured another Clemens/Twain autograph. Two featuring the autograph of Field’s wife, Julia, and one with a note from Field’s son, matching almost exactly the note in the back of the Cruikshank volume. Naturally, we went on a hunt to find these other books on our stacks. The Byron we were unable to locate. Special Collections does have an 1832 set of Byron’s Works, but it is in 17 volumes, not 14, and in a green library cloth binding, not gold tooled green leather. 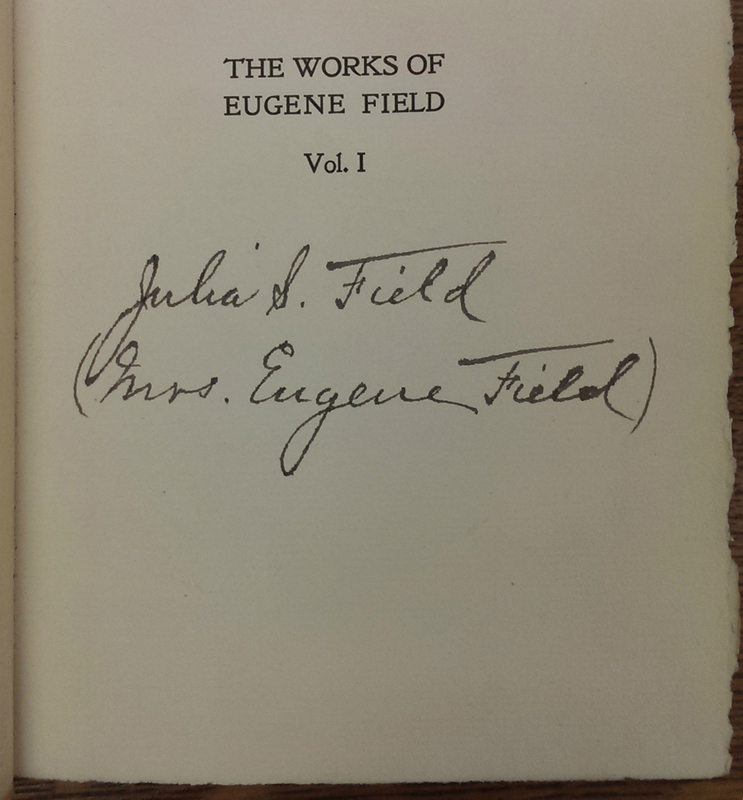 None of the volumes bears the autograph of Eugene Field on the title page. Interestingly, the first 12 or so of the volumes indicate that they are “volume __ out of 14” whereas the final volumes are “out of 17″. Whether the publishers changed their minds about the size of the set mid-run, or we have two partial sets put together, I don’t know. We were eventually able to find the inscribed copy of Chesterfield’s Letters to His Son, but it was being kept in the general stacks, not in Special Collections! After verifying that this copy was the same one mentioned in the library newsletter, we rescued the two volume set and transferred it to our rare book collection. However, there are some odd things going on with this inscription from Eugene Field II. This particular edition of Chesterfield (the Beau Brummel edition) was printed in 1925, although the note in the back from Field’s son is dated 1921. The copyright for this version of the text goes back as far as 1901, but even that is a full six years after Field’s death in 1895. Needless to say, these facts cast some serious doubt on his son’s claim that the book came from his father’s library. We were also successful in finding the listed copy of Field’s Writings in Prose and Verse. Sure enough, the half-title of the first volume seems to bear an inscription from Julia Field. Again, there is something odd about this inscription. Maybe I’m being too cynical, but the parenthetical addition of “Mrs. Eugene Field” after the name seems a little too on-the-nose, don’t you think? Also strange is the fact that the signature only appears on the first volume of the 12 volume set. Ah well, perhaps Mrs. Field was merely autographing the work for someone else, to add value to the set — the world may never know! The Washington Irving set was right where it should be on the shelf. Eugene Field’s (supposed) autograph, matching the one in our Cruikshank, was indeed penned on the inside cover. Note in the back of the 1828 Irving. 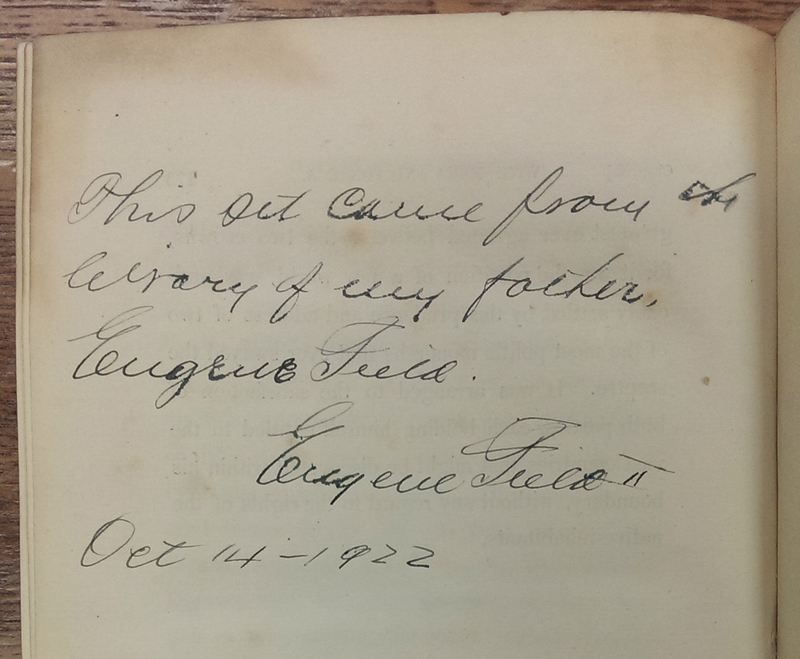 Interestingly, however, we found another note from Field’s son, on a rear flyleaf of the first volume. This note was not included in the set’s description in the 1952 newsletter. As with the other six books with supposed Field provenance, I have my doubts that the Eugene Field autograph in our Irving volume is authentic. If it is supposed to be an ownership inscription, which it certainly looks like, why is only the first volume signed? There is another, older ownership inscription in this same book (on the title page), and that signature appears consistently across all four volumes (which is much more common, in my experience). What if Field had loaned or lost volumes 2, 3, or 4? Am I being too cynical again? Unfortunately, we were unable to locate the Shakespeare or the Tarkington sets among our collections. There is no trace whatsoever of the Shakespeare volumes, and no record of sale or deaccession. The Tarkington, however, is another (stranger) matter: we do have a 16 volume Tarkington set matching the newsletter description almost exactly… except that it’s No. 315 in the limited set of 1075, not Mr. Munn’s copy No. 2. As such, no Julia Field autograph — real or not — is present in our Vol. 1 (or any of our volumes, for that matter). How did we come to acquire Munn’s set No. 2 in 1952, only to have it replaced with a nearly identical, but differently numbered set in the intervening 62 years? Our doubts about the Cruikshank Twain/Field autographs were only compounded by the discovery of these other volumes with similar inscriptions. By finding this donation record in an old newsletter, we were able to move one link back in the chain of provenance, but many questions still remain about the authenticity of these signatures. However, the somewhat ironic fact is that the notoriety of Eugene Field II has ended up adding some value to these works after all, even if the autographs are fakes. A set of forged signatures would make an interesting collection in its own right! ← Disarticulated Remains: Evidence of Ritual or Scavenging?